The new model Kuvings E6000 Domestic Cold Press Juicer replaces the original B6000 Domestic Juicer. ✓ Allows you to put larger ingredients without cutting. Less cutting means faster and more convenient juicing. 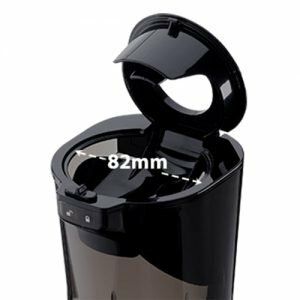 Bigger “O” shape flip gate feeding tube – the 82mm (wider than previous models) wider feeding chute of the Kuvings E6000 Cold Press Juicer allows you to juice whole fruits and vegetables and simplifies the juicing process without cutting. 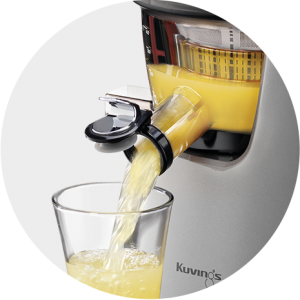 Quiet Operation – the operation noise level of the Kuvings E6000 Juicer allows you to enjoy a fresh juice in a relaxed and calm atmosphere. Freshness and Minimized Nutrients Loss – by juicing whole fruits and vegetables the juice is rich in nutrition, minimizing nutrients loss and oxidation which occurs when cellular walls are destructed. 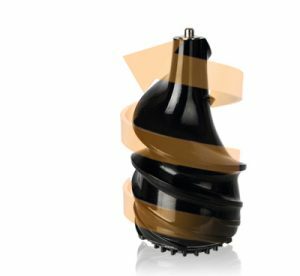 Ultem™ (Screw and Strainer) is a durable and eco-friendly material also used in NASA’s space shuttles and for medical equipment. The screw and strainer are made of this superior material in order to offer our customers only the best quality. Tritan™ (Juicing Drum) is an environmentally safe BPA-Free material approved by the USA’ FDA, Europe’s NSF and Japan’s Health Department for use in food containers. This eco-friendly material is used for the Juicing Drum. J.M.C.S Low-Speed Masticating Technology (Patented in 50 countries). Kuvings’ unique technology, J.M.C.S (Juicer Module Comprising System) is designed to produce pure and natural juice by gently squeezing fruits. High Performance Motor in-house manufactured AC induction motor ensures consistent quality. 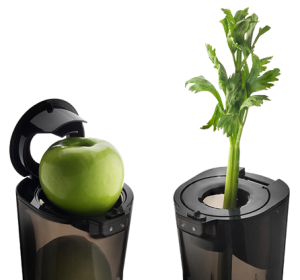 The 240W high performance motor runs silently and is able to juice even harder vegetables with the proper preparation. Safety – The flip gate system is designed to prevent children’s small hands from entering feeding chute. It is also means no pushing ingredients in with a pusher. Great for those with less strength in the wrist.